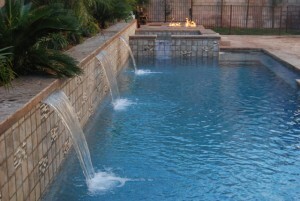 Laguna has been a Las Vegas Pool Construction And Spa Building company for more than 20 years. During this time we have set ourselves apart as the most innovative outdoor living environment designers and builders in the Valley. Whether you're a first time pool owner or enhancing an existing pool and spa, the benefits are many and include quality family time, a healthy lifestyle, and increased home value. Installing a pool or spa or is an investment in time and money and finding a reputable company is key to the success of the project. We have found that the most common cause of frustration is not knowing what to expect. We hope that this guide will assist you in understanding the swimming pool construction process. Whether you want to enhance the look of a dated swimming pool or make radical changes to create a completely different yard, Laguna has the expertise to bring new life into your outdoor living area. The benefits of renovating your concrete pool outweigh starting from scratch. Not only is it more environmentally responsible, but financially sensible since the demolition of the old pool results in high labor and disposal costs. If you haven’t bought a swimming pool in the last 10 years, then you’re definitely going to want this report, called “10 Steps to the Perfect Pool,” it is written specifically for homeowners by an independent third-party pool specialist.